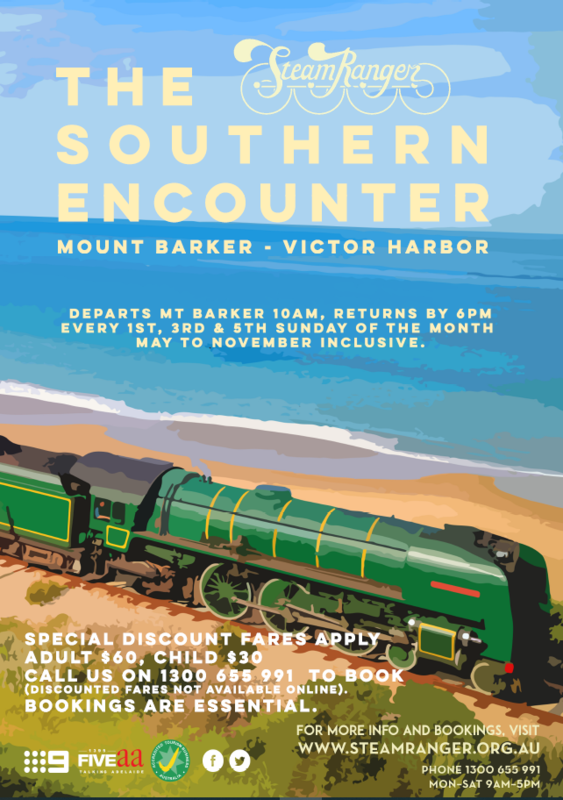 The Southern Encounter operates on the first and third Sundays from May until the end of November. The journey then continues southwards across the plains and well away from the main road native bushland unfolds from your carriage window and kangaroos and other animals might be seen trying to keep pace with the locomotive! Then its across the towering Currency Creek viaduct and on to Goolwa. At Goolwa, the train draws alongside the river wharf and passengers alighting here have over four hours to explore local attractions, have lunch on the riverside, visit the Steam Exchange Brewery in the old goods shed or take a short river cruise. Beyond Goolwa the train then meanders westwards to the picturesque holiday settlement of Port Elliot before cresting the cliffs where passengers can experiemce some of the most picturesque coastal scenery in the State, with nothing separating you from the beach below and a perfect view of the Southern Ocean – in winter the home of Southern Right Whale. Then into Victor Harbor for a three hour stopover. Discounted Fares apply when booking via our 1300 number!